As useful as the tiny Amstrad CRT was I wanted something bigger, brighter and sharper. LCD is terrible for retro systems with blurry scaling attempting to draw images designed to take advantage of CRTs. Emulator authors spend significant effort trying to mimic CRT effects for a true retro feel but the best option is just to use a CRT. Most machines in the 80s and early 90s were designed for TV compatibility and so operated on a 15KHz horizontal refresh rate. The VGA CRT monitors people struggle to give away aren’t going to work as they start at 31.5KHz. British machines like mine also use the PAL (UK) video system rather than the NTSC (USA) system - ideally a display would handle both. If you don’t need any VGA frequencies then a Sony PVM is the way to go. I also own an Amiga 1200 which is capable of some VGA modes so it would be nice to have one CRT for everything. Multi-sync monitors can do both but were rare back then and are even rarer now and the shipping cost on CRTs limits can be prohibitive. Luckily for me a Commodore 1942 CRT “bi-sync” turned up on Craigslist just 15 minutes from my house for $50. It was designed for the later Amiga models so it does both 15KHz most of my machines can do and some VGA resolutions too. Perfect. Connecting it to the BBC was a little trickier than I anticipated. That Amiga design means it expects the horizontal (HSYNC) and vertical sync (VSYNC) signals on two different pins to match the Amiga’s video port rather than the composite sync (CSYNC) all my RGB capable machines offer (Amiga excluded). I briefly experimented with connecting the CSYNC to HSYNC, VSYNC and indeed both but failed failed to get a stable display. Digging in to the Motorola 6845 CRT controller chip that powers the Beeb reveals both VSYNC and HSYNC on pins 40 and 39 respectively. A quick snip of the RGB port’s unused 5v and sync pins let me repurpose them to HSYNC and VSYNC direct on the 6845. A stable but over-saturated picture was a welcome next step that didn’t involve me needing to create a SYNC splitting circuit (I did that later to connect with my Spectrum +3). The over-saturation is because the BBC Micro outputs either 0V or 5V - off or on - for each color. The Amiga monitor is analogue and accepts any amount of color between 0V and 0.7V. I read guides on calculating the voltage drop but it still looked saturated so I kept increasing resistor values until I found values that looked right. The final result definitely made me smile. It looked better than the Microvitec CUB monitors our school had back in the day without losing the CRT appeal. Success! Hearing Superior Software’s SPEECH package blurt out any phrase we cared to throw at it was a blown-away moment at school. 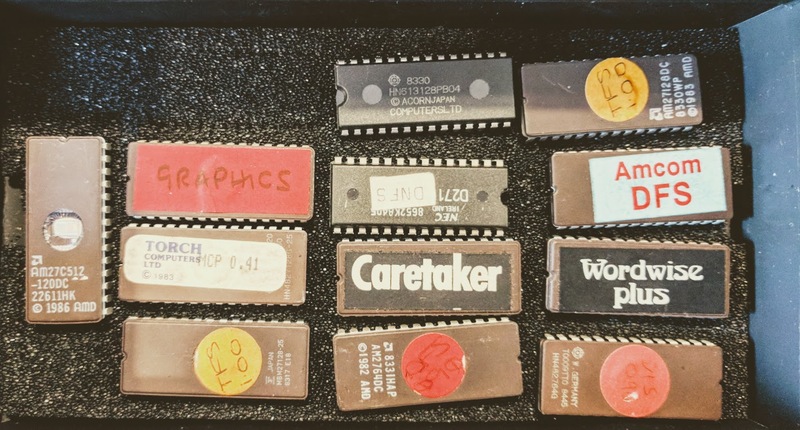 I’ve always wondered what the official Acorn speech system was like especially as every time I open the case empty sockets IC98 and IC99 call out for the Texas Instruments TMS5220 speech processor and associated TMS6100 voice synthesis memory. 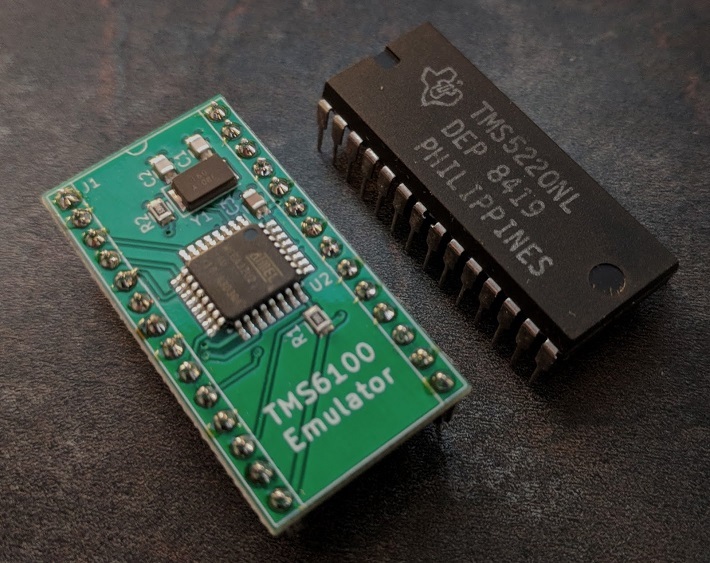 The TMS5220 chip was a successor to that in Speak & Spell, Bally/Midway pinball machines and some arcade games as is quite easy to come by. The TMS6100 was available in many variants and the BBC commissioned some of their own including one sampled by BBC news anchor Kenneth Kendall. This chip is rare now and the fact the TMS6100 is not a regular ROM means you can’t just burn a copy. Thankfully Simon Inns created an emulator which can run on an ATMega32U2 to provide a drop-in replacement! Pressing any key on the keyboard will cause the machine to say aloud the letter although it has some odd ideas about what the symbols on the keyboard are. *SAY I've got a bad feeling about this. Up to 16 paged ROMS are therefore catered for, 4 of which are on the main circuit board. So the OS supports 16 ROMs but there are only physical sockets for 4 (IC52, IC88, IC100 and IC101). Typically BASIC and the disc filing system (DFS or ADFS) take two of them leaving just two usable ROM sockets for expansion. The schematics reveal IC76 is the ROM Select Latch and is a 74LS163 with 4 output pins thus providing 16 possible combinations - one for each ROM you could use so both the OS and the circuitry can support what we need if we could physically get the ROMs wired in. The /PGM and Vpp lines are for writing - an EPROM programmer will care about these but our Beeb won’t. The A14 and A15 lines are the address lines for accessing the higher memory. With them both low the chip just acts like a regular 16K (27128) chip. With A14 high it looks to the next available 16K, with A15 high the next 16K and with A14 and A15 high the final 16K. So what we can do here is combine four 16K ROM images into a single 64K file and flash it to our 27512 which is just what I did with my Signstek TL866A Universal USB programmer. 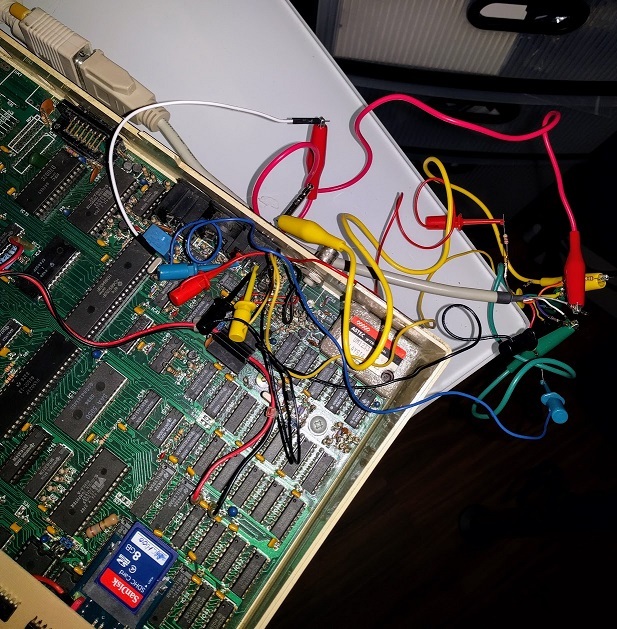 Now by connecting A14 and A15 to the IC76 address line C and D outputs we have effectively given whatever socket we connect this two the ability to appear as four ROMs (this works only because a single ROM can be paged in at a time). The final icing on the cake is that the Beeb sports a push-out section left of the keyboard (affectionately known as the “ash tray”) where a zero insertion force - ZIF socket - could be mounted to allow a ROM to be dropped in without needing to crack open the case (our school was definitely not wanting us to open the machines and yet only one machine had this upgrade installed). Now I just need to figure out how to mount this ZIF socket in the ash tray hole - there aren’t really any mounts. I suspect I’m going to need to make a PCB of some sort and put legs on it. Now insert a 27512 ROM flashed with four BBC ROMs of your choice, power up and type *HELP or *ROMS to see the images ready. The Beeb has a bunch of expansion ports hidden underneath the machine - the most unusual one being the Tube expansion bus which allows for a 2nd processor by way of a FIFO buffers that facilitated message passing IPC for console, errors, data and system calls. 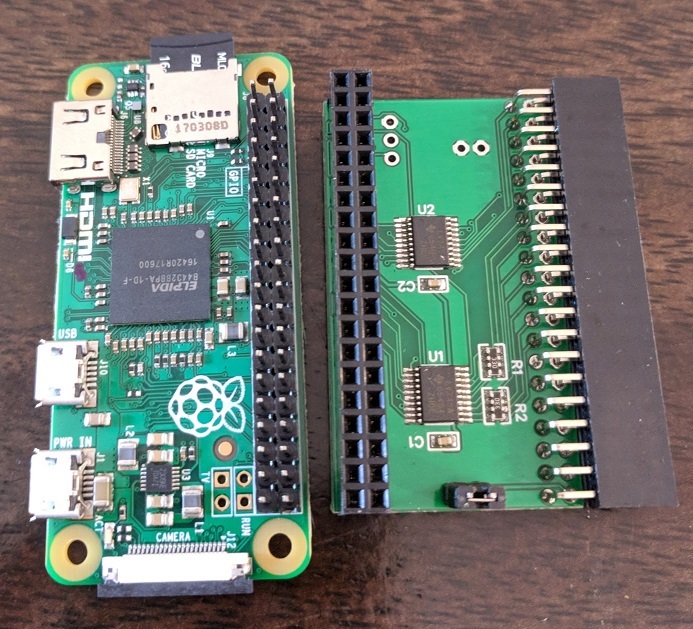 What piqued my interest was using the Raspberry Pi Zero though. It’s small enough to fit under the BBC Micro and remain plugged into the Tube port out of sight. Latency was a problem on the Zero given the lower ARM processor so they ported the CPU emulation core… to the GPU! The 6502 emulation is reliable and enabled me to run the 6502 Second Processor Elite. 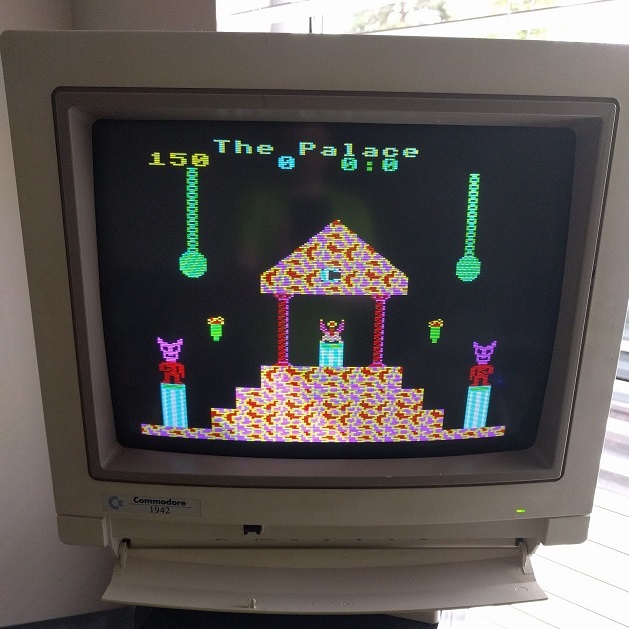 I definitely need to try and get GEM running on it just for fun although it’s a little trickier to find suitable disk images for Z80 and 80286 co-processor stuff.